Today I found out about H.H. 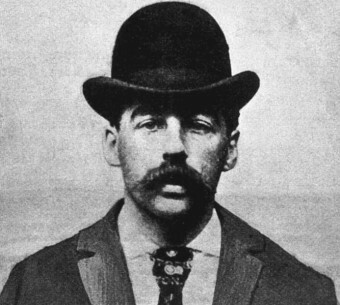 Holmes, one of the United States’ first serial killers. Herman Webster Mudgett was born in 1861 in New Hampshire to a relatively wealthy family. He was reportedly extremely intelligent from a young age, and went on to study medicine at the University of Michigan. But he was also implicated in the death of one of his friends when he was young, and during his stint at the University of Michigan, he was caught stealing corpses and using the bodies to make insurance claims. This was just the start of his life of lies and crime. He also participated in forgery, real estate scams, horse theft, polygamy, adultery, and, of course, gruesome murder. An 1886 move to Chicago set the stage for the known murders that would make this serial killer famous. 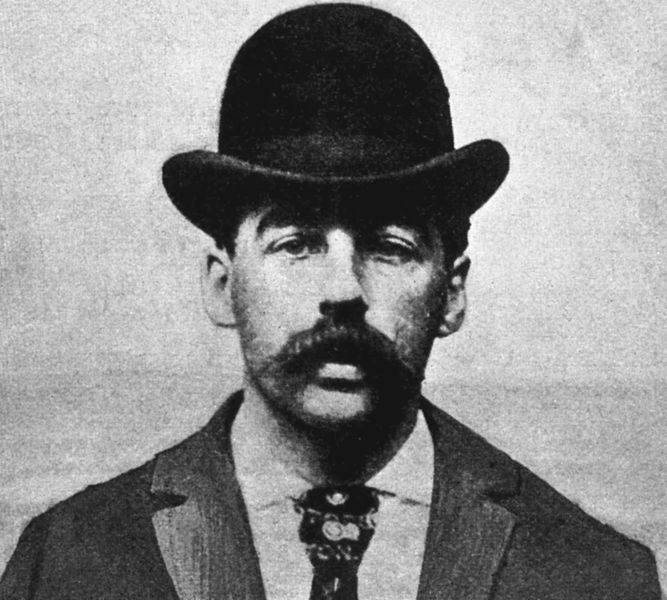 Shortly after arriving in the city, he started working in a pharmacy in the Englewood neighborhood of Chicago, using the name Henry H. Holmes. A few years later, he took over the business. The circumstances surrounding this takeover are unclear. Most accounts claim that the previous owner, Dr. Elizabeth S. Holton, mysteriously “disappeared,” at which point Holmes took over the pharmacy. However, there is significant evidence that Dr. Holton simply got pregnant and decided to sell her business, including a record showing that Holton’s daughter was born in 1887, and there are records of Dr. Holton being in the area until 1910, well after Holmes himself had died. Whatever the case, after he acquired the pharmacy, Holmes had a three story building with 60-100 (many windowless) rooms constructed across the street and then moved the pharmacy there. It was nicknamed “the Castle” and besides functioning as his living area and new location of his pharmacy, he opened it up as a hotel as well. This wasn’t just any hotel though, and before long it would be nicknamed the “Murder Castle” and “House of Horrors.” There were secret passageways, twisting hallways, doors that opened to walls, stairways to nowhere, door knobs that locked from the outside, air-tight and sound proof rooms—all the makings of a spooky haunted house. Holmes likely started murdering his first victims of the hotel directly after construction was finished, with the peak killings thought to have occurred during the Chicago World’s Fair in 1893. At this time, hotel guests were plentiful and many people who arrived in the city chose not to return home after; so disappearances of individuals was common, even when they weren’t being murdered. Most of his known victims were young, usually blonde, women that he would hire to work for him. Eventually they would be led to the upper floors. While it likely varied what happened from here, it would seem from the design that he would trap his victims in the sound proof rooms before asphyxiating them via gas jets he had installed for that very purpose. He would then dump the bodies down long chutes which led to the basement. In the basement were lime pits and a kiln to destroy the remains of the victims, as well as a table for dissecting them, and various implements of torture, such as a stretching rack… One would assume from this that not all the victims were dead when they found themselves in the basement. Holmes would also require some of the girls, occasionally after becoming engaged to them, to take out life insurance policies as a condition of employment. He, of course, would pay the premiums—with the condition that he was named a beneficiary. In addition to collecting the insurance money, Holmes would sometimes sell their bodies, or just the skeletons and some of the organs, to medical schools. In one corner of the building, Holmes also offered an illegal abortion service. It’s estimated that hundreds of women saw him to have the procedure performed. Some of them did not survive—abortion was a risky thing for the mother back then anyway, and Holmes likely wasn’t the most cautious of doctors. He is also thought to have intentionally murdered some women this way. Because so many of the bodies were destroyed, it’s impossible to know how many people he murdered, but estimates range as high as 200. However, the real total may be significantly lower. Holmes himself initially confessed to 27 murders (which were confirmed) and 6 attempted murders. However, he later increased his estimate to over 100; so take from that what you will. While his victims are thought to have been mostly women, he also is known to have murdered several men and children. Holmes was eventually caught—not because people finally connected his creepy hotel with dozens of disappearances, but because his practice of insurance fraud caught up with him. He had left Chicago shortly after the fair, but continued to commit insurance scams with a partner, Benjamin Pietzel, then landed himself in jail in July of 1894 for selling a horse he didn’t own. His mistake was telling his cellmate about a plan he had to fake his own death and collect on his own life insurance policy. His cellmate, the noted criminal Marion Hedgepeth (aka “Derby Kid”), later tipped off the authorities, supposedly due to Holmes not paying him the $500 Holmes had promised in exchange for the name of a lawyer who could be trusted to help out with the life insurance scam. Shortly thereafter, Holmes headed to Philadelphia where he modified the plan slightly- this time with his friend Pietzel faking his death after buying a $10,000 life insurance policy. Holmes was supposed to find a body to use as Pietzel’s, but instead simply killed Pietzel and convinced Pietzel’s wife that Pietzel was still alive, as per the original plan. Pietzel at the time had five children, three of whom Pietzel’s wife put in Holmes’ custody while she traveled to Canada with the other two. Needless to say, the three didn’t have a chance and were murdered shortly before the police finally caught up with Holmes on November 17, 1894. Initially, he was simply charged with insurance fraud and the theft of a horse, though the investigators were aware that he may have committed murder. They just didn’t have any direct evidence at this point. As police investigated Holmes, they were drawn back to the Murder Castle where a custodian informed them that he had never been allowed to clean the upper story rooms. When the authorities explored the Castle, they found all manner of devices: poisons, gas chambers, coffins with the bodies of women, an incinerator, and a dissecting table, among other nefarious instruments. They also discovered parts of destroyed bodies, but the bodies were too decomposed for officers to determine how many people had been killed. In the end, Holmes managed to make a great deal more money off the whole affair when the Hearst Corporation paid him some amount of money (the exact amount is disputed, but somewhere between $7,000-$10,000, or around $183,000-$261,000 today) for a full confession from him. What they ended up getting, however, was a story that had many holes in it, and which he changed over time; so it isn’t clear how much of it is accurate. At one point he even claimed he was innocent, then later that he was possessed by Satan. As mentioned, he did eventually confess to numerous murders as stated above, and was ultimately convicted. On May 6, 1896, he was hanged for those of his crimes that could be proven. His neck did not break when he dropped, and he reportedly struggled for a full 15 minutes before he finally stopped kicking. Five minutes later, he was pronounced dead. Despite his death, he indirectly managed to claim another life, though. The caretaker who had informed the police about being unable to clean the upper rooms committed suicide in 1914. His family members claimed that he had been “haunted” leading up to his suicide. As for the hotel, on August 19, 1895, it was completely destroyed by a fire. Later, a post office was built on top of it. To find out more about this monster, read “The Devil In The White City”. Excellently researched study of not only Holmes, but, the architectural background of Chicago’s World’s Fair and how the two stories intertwine. There’s also a creepy documentary on Netflix about him.